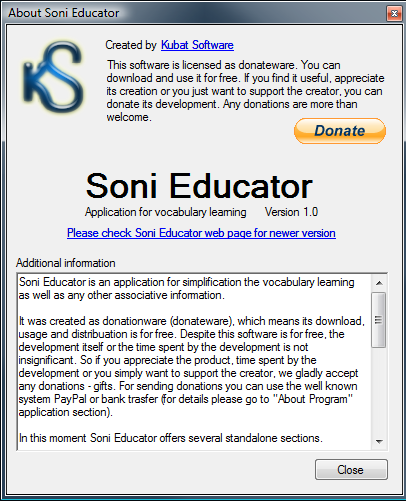 Soni Educator is an application for simplification the vocabulary learning as well as any other associative information. It was created as donationware (donateware), which means its download, usage and distribuation is for free. Despite this software is for free, the development itself or the time spent by the development is not insignificant. So if you appreciate the product, time spent by the development or you simply want to support the creator, we gladly accept any donations - gifts. For sending donations you can use the well known system PayPal or bank trasfer (for details please go to "About Program" application section). In this moment Soni Educator offers several standalone sections. Dictionary - It allows user to define new or change existing dictionary and all its parts like clause, gender or categories, add or edit categories and indeed define new and edit or delete existing vocabularies. 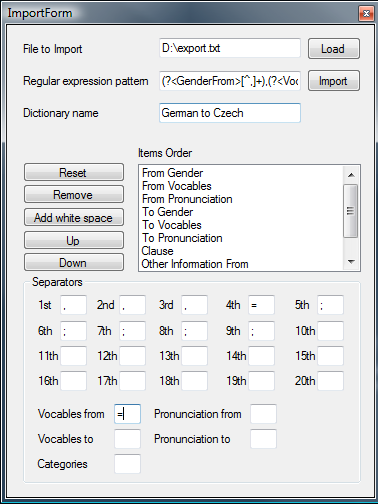 It is possible to define for every dictionary item number of variants of vocable in both languages, set clause and gender. Exams - It allows user to create exams. 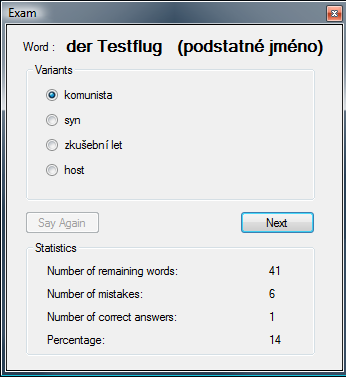 User chooses the dictionaries and categories which he wants to be tested in, size of the test, the direction (what language should be tested) and the type of the test. 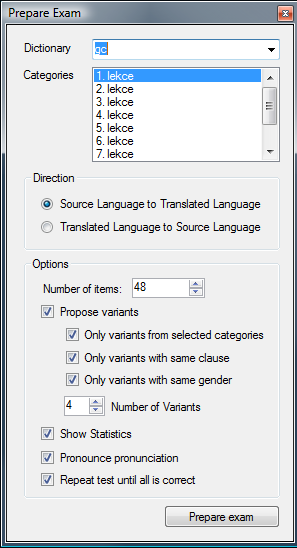 There are two types of tests - with suggested variants (where user selects one variant) or without variants, where user has to write down the correct translation. Reminder - It allows user to define "Reminder Strip" , which is a small strip on the screen, where it displays one item after another in a cycle. 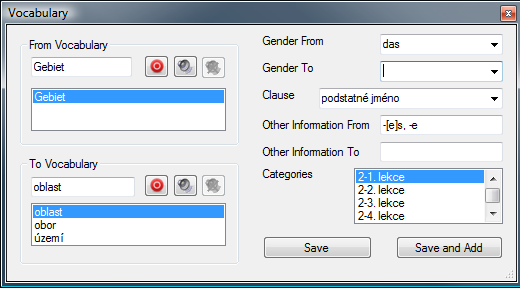 It is possible to define reminder for specific categories and with the speed user wants it. 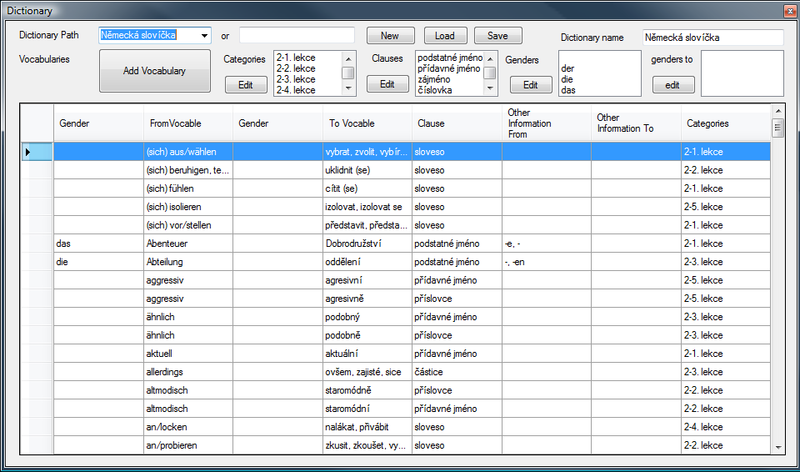 This is an ideal way for vocabulary learning during the PC work. About application - It displays the information about application. In near future we plan to do an import wizard, which will be partially able to import dictionaries from another programs or formats.